XT Miniature Controls includes nonreversing contactors, auxiliary contacts and mini overload relays. A wide range of applications is possible including small electrical motors from fractional to 5 hp (460 Vac) or up to 4 kW (400 Vac). Due to its compact size, the XT line of mini controls is best suited to be applied in light duty loads such as hoisting, packaging, material handling, heating, lighting and automation systems. XT mini contactors are a particularly compact, economic and environmentally friendly solution wherever control of small motors or loads is required. Front mounted snap-on auxiliary contacts for mini contactors are available with screw terminals in a variety of contact configurations. Auxiliary contact modules are standard with interlocked opposing contacts, except in the case of early make or late-break contacts. The XTOM overload relays are three-pole electromechanical motor circuit-breakers using bimetallic elements. They are suitable for monitoring both DC and AC currents. Type XTOM overload relays have been designed to be fitted directly on to XTMC contactors. 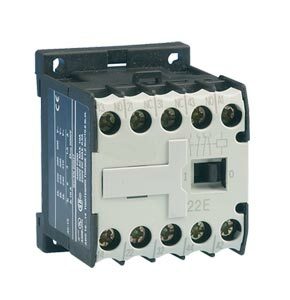 In the event of overload tripping, the auxiliary contacts change over and disconnect the control voltage circuit from the corresponding contactor relay, and thus indirectly switch off the current to the motor being monitored. The XTOM relays are adjusted by means of a setting wheel to suit the motor current rating.